'Gyu' stands for 'Cow' in japanese. Wagyu, to put it simply, is beef known for a richer flavor due to it's marbling. This is again another excellent example of the fatter it is, the tastier it is. Sad but true. But with all things in the world, you have to pay a premium for premium grade, Wagyu beef is no exception to this rule. But Mos Burger is going to change that. 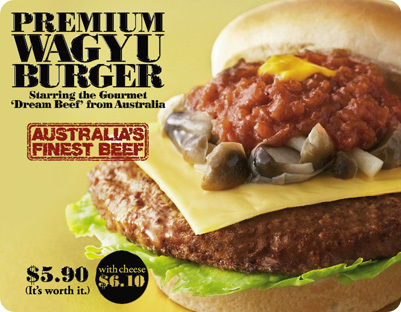 Mos Burger's Wagyu Beef Buger uses Wagyu from Australia. Between the two soft buns is a leaf (or two) of lettuce, the star player, some mushrooms, Demiglace sauce with a dab of mustard. With a difference of $5.90 and $6.10 for the cheese and no-cheese version, it is a no brainer for me or for anyone to choose the cheese(maybe not for the lactose intolerant). My teeth faces little resistance from the patty as it slices it with ease. The fungi, whose identity I can't verify, adds a little more bite to the burger but does not add much taste. For the fungi haters out there, fret not, it does not have the smell which disgusts you. There is always the option to say " No mushrooms " at the counter. Demi-glace sauce, one of the mother 5 sauces in French cuisine, is widely used in Japanese-Western fusion cuisine Hayashi rice. It is a brown sauce that is highly versatile, which you can use it as a base for something else or on it's own.The one here is slightly thick and reddish brown, and complements the burger nicely, not the best, but good enough. Ask for more sauce if you like more flavor. The process of creating a demi-glace sauce from scratch is highly laborious, so there exist ready made sauces or mixes(Heinz) in the market, I wonder if Mos Burger makes it from scratch or...? I do not recommend chili sauce nor ketchup for it does not require any more condiment, this delight should be experienced by itself. At a price of $6.10(or $5.90 for the non-cheese version), people might think it a little expensive for a burger, but given the size of the patty, the better cut of meat used, it is worth it. Try looking for a Wagyu burger or anything with Wagyu in their name for the price of $6, I doubt you can. I am not sure how long this will be on the menu, so hurry to a Mos Burger now before its gone.